Morus macroura growing tree of the genus Murus is also known as Himalayan mulberry, Morus macroura perennial deciduous plant, also used as ornamental plants grow in temperate or mediterranean climate and growing in hardiness zone 5-10. Flower color white, flowers small grow in groups that connected to each other in cone shape. Mulberry fruit assembled from small cells (fruit) that make cone shape 7-10 cm. 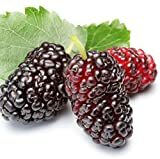 The mulberries color: red, purple dark to light, black, after the fruits recommend pruning little the tree sometimes after the prune the tree blooming again. 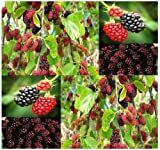 What can be done with big quantities of Morus macroura fruits?